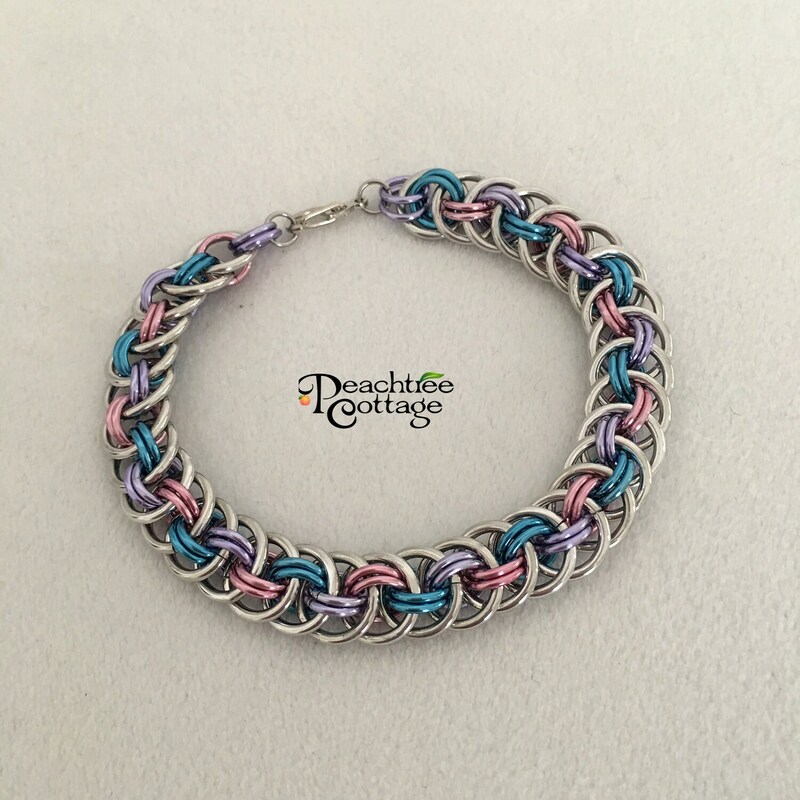 This lovely bracelet is made with 18 gauge Bright Aluminium and Color Annodized Aluminium rings woven together in the Viper Basket weave to create a chain maille bracelet. The Viper Basket style Chainmaille Bracelet is then finished off with a spring lobster claw clasp. It is light weight, strong and won't tarnish - perfect as an accessory for both day and evening wear! How to find your size - Measure your wrist around the bony area with a measuring tape to find your wrist size. Once you know your wrist measurement add 1/2 to 1 inch to the length for a comfortable size. Handmade jewelry is an art that requires time and attention to detail. Each item is an intricate piece of work. I do everything by myself from scratch to create a piece of beautiful jewelry. Colors may vary based on your individual display and printer settings. All computer monitors display differently and all printers print differently. However, please be assured that each of my items is represented accurately to the best of my ability. Each of my creations is individually handmade in a smoke-free environment. I had a question regarding the pattern and the shop owner responded to my question within a couple of hours. She told me she would get back to me after she had a chance to review her pattern where I was have difficulty. I had the answer to my question that same day. Love the pattern. Can’t wait to make for my first niece!!! Gorgeous pattern and perfect for a gift! Can't wait to wrap my grand daughter in it! Yes I accept Custom order requests. Please send me a conversation message letting me know what you desire and we can discuss the details from there. Can I sell the items I make from your patterns? My patterns are Copyright © Peachtree Cottage™ - All Rights Reserved Worldwide. This means my patterns are copyright protected and cannot be changed, sold, shared, given out or reproduced in any way. However, you are free to sell any items you make from my patterns. Do you make everything in your shop yourself? Each item in my shop is individually made by me in a smoke-free, non-shedding dog friendly environment. Attention is paid to every detail and care taken to avoid errors, however I am human and sometimes mistakes happen. What if I have other questions not covered by the FAQs? If you have any additional questions, please feel free to contact me and ask them. I will do my best to answer you as soon as possible. Can I receive a refund if I forgot my Coupon Code during purchase? No. Coupon Codes must be electronically validated by Etsy at the time of purchase. I do have multiple codes available but only ONE code can be used per transaction. Coupon codes cannot be combined. By policy Etsy allows only one coupon code per order.